Mitra Creative has just produced a new website for Big Arrow Group, a New York-based full-service strategic consulting (branding, advertising and marketing) and communications firm. 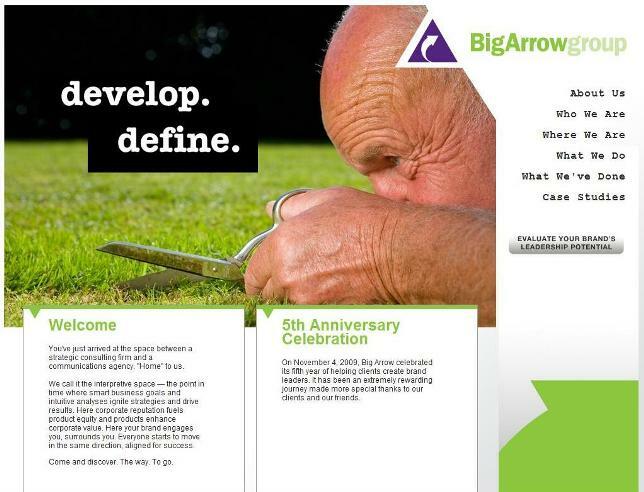 SEE THE NEW BIG ARROW GROUP BY CLICKING HERE. The new site is a refresh of Big Arrow Group’s interactive presence, reflecting an expansion of their brand and global capabilities. As with other recent Mitra Creative projects, in addition to introducing an uplifted design for Big Arrow, the site is supported by a custom-programmed/implemented content management system (CMS) and database framework. This CMS architecture will self-empower them to keep their offerings, case studies, media/multimedia and other information up-to-date. Mitra Creative worked closely with Big Arrow Group’s leadership to ensure that the new website embraces their personalities and working style. It was important to reflect the genuine humanity of, and the spirit of collaboration in, the interaction between Big Arrow and their clients. Therefore, specific visual elements — such as Pantone colors reflecting the individuality of each member of the team — have been incorporated into the design to demonstrate Big Arrow’s true personal touch.